Balkanabat (Балканабат, بلخان آباد), formerly Nebit Dag and Neftedag, is a city in western Turkmenistan and the capital of Balkan Province, the largest province in the country. It is located at 39°31′0″N 54°22′0″E﻿ / ﻿39.51667°N 54.36667°E﻿ / 39.51667; 54.36667, at an altitude of 17 metres. Balkanabat lies at the foot of the Balkan Daglary mountain range. 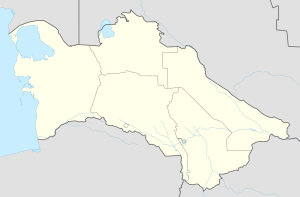 Balkanabat is about 450 km west of Ashgabat and 160 km east of the port city of Turkmenbashi. The city has an airport with scheduled daily flights to Ashgabat. The town was founded in 1933 as "Neftedag", meaning "Oil Mountain" (from Russian neft, "oil", and Turkmen dag, "mountain"), as a settlement along one of the stations of Trans-Caspian Railway. In 1946, when it was transformed into a city, it was renamed "Nebit-Dag", also meaning "Oil Mountain" but this time using the Turkmen word nebit. There is a large monument on the far eastern side of the city called "Monument to the Desert Explorers" which depicts a camel and several men struggling to walk through the windy desert of Karakum. Nebit Dag was renamed to Balkanabad (Balkan from the name of the Balkan mountains, abad – city) in 2001 by the decree of former President of Turkmenistan Saparmurat Niyazov. The city has a "Health Path," which is a concrete path outside of the city built to give the citizens of the town a place to take a moderate hike along the mountainside. It was opened in 2004 to model a similar concrete path outside of Ashgabat. The city has five bazaars (markets) Gök, Jennet, Gündogar, Bereket and bazaar on 5th microregion. There is hotel "Nebitçi", a theatre, museums, restaurants and parks in Balkanabat. The north side of town contains the large park "Saparmyrat Türkmenbaşy Seýilgähi" which contains tennis courts, a life-size chess board and plenty of benches. The Yomud tribe was historic to the Balkan region and the Yomud carpet göl (pattern) is one of the five patterns represented on the Turkmen flag. Most of the residents are Turkmens; other ethnicities include Russians, Kazakhs, Lezgins, Azeris, Armenians, Uzbeks, Tatars and Karakalpaks. Tajiks are also found. Balkanabat has a cold desert climate (BWk) according to the Köppen climate classification. It is an industrial centre for petroleum and natural gas production. Animal breeding and wheat and cotton cultivation are another areas of economy in Balkanabat. The city is served by Balkanabat Airport. The city is connected to Ashgabat by Turkmenistan Airlines, as well as by train and bus. Buses route is from east to the west of Magtymguly shayoly (highway) and makes stops at bus station. While there is no official cab company, private citizens operate shared cabs. Almost any vehicle will pick up passengers and a ride costs is about 1 Turkmen manats (0.35 US cents). If the driver has already passengers in the car, then he will agree to take you if headed in the similar direction of their other available passengers. The city layout is a grid of apartment blocks called kvartal (quarters). There are main streets called Magtymguly, Pervomayskiy and Gurbansoltan eje shayoly. There are range of national banks, Turkmenpostal services in the centre by Magtymguly Shayoly, near 197 kvartal. There are a Kazakh school named after Madi Begenova, a Turkmen-Turkish high school and Turkmen primary and secondary schools. There is one 3-star hotel Nebitchi in the centre of the city. ^ Zonn, Igor S.; Kosarev, Aleksey N.; Glantz, Michael H.; Kostianoy, Andrey G. (2010-05-26). The Caspian Sea Encyclopedia. Springer Science & Business Media. p. 70. ISBN 9783642115240. ^ Mayhew, Bradley; Bloom, Greg (2007). Central Asia. Lonely Planet Publications. p. 420. Heading west, on the road to Turkmenbashi, is the Monument to the Desert Explorers, a handsome concrete statue of caravan men urging forward their obstinate camel in the midst of a fierce sandstorm. ^ Landau, Jacob M.; Kellner-Heinkele, Barbara (2011-12-18). Language Politics in Contemporary Central Asia: National and Ethnic Identity and the Soviet Legacy. I.B.Tauris. p. 158. ISBN 9780857720856. ^ "Nebitdag (Balkanabat) Climate Normals 1961–1990". National Oceanic and Atmospheric Administration. Retrieved 9 March 2017. Wikivoyage has a travel guide for Balkanabat. This page was last edited on 19 December 2018, at 14:16 (UTC).